Hi: I am trying to install a bath fan light fixture. Upon taking out the old one, I stupidly did not take a pic of the wiring. What I have is a 3(+ ground) cable and a 2 wire cable in the ceiling. The fixture is wired to a 2 rocker wall switch. I have tried numerous combos of wires and cannot get itright. The fixture has 4 wires- 1 blue 1 white light and power wires 1 black 1 white.Anyone have an idea how to wire this so both switches work? Last edited by Lasalle; 08/24/16 07:45 PM. There should be mfg instructions and wiring diagram in the boxwith the fan. Basic 'ringing' out the wiring will solve the situation..
Forum policy is not to provide information to the general public. You may be better off locating a local licensed electrical contractor. If things are as they should be. the 3 wire cable goes to the switch, you feed the black from the 2 wire cable to the white in the 3 wire and the other 2 are the switches coming back. They go to the blue and black wires in the fan/light. The white from the 2 wire cable goes to the whites in the fan. Open the switch box to confirm that the white actually feeds both switches. Those "hot" whites in the 3 wire cable should be reidentified to some other color with tape. The two wire might also be tied in with the light to power a second light like the wall light over the vanity. Yes normally the 3 wire would be in the first light but if a remodel happened or the sparky just did it different it could be that way. 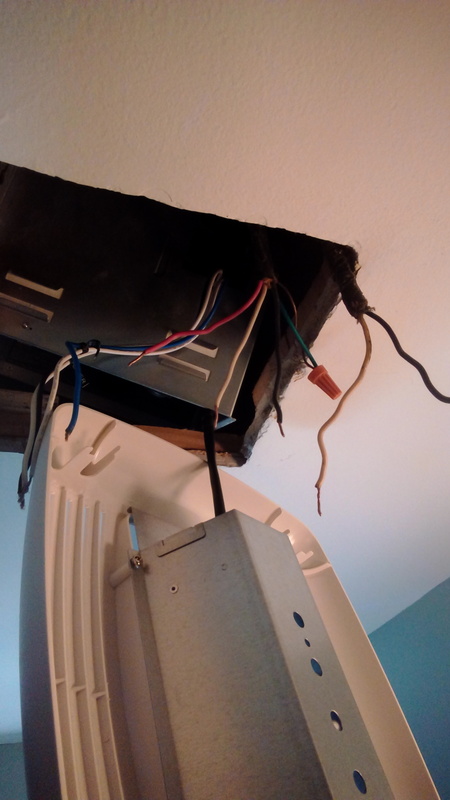 Another scenario is that the three wire may be the line in with a switch loop back although to switch both individually would have required improper use of the grounding conductor (which is common in DIY installations). An electrician would be able to figure this out in a couple of minutes as Hotline suggested. Trial and error wiring methods are risky at best. Last edited by BigB; 08/25/16 11:57 AM. "Trial and error wiring methods are risky at best." That is why I suggested looking in the box with the switch to verify the wire colors and as a sanity check that you are looking at the right cable. Please....do not think I have any issue with your comments. I thought of possibly locking this out, but decided to let it ride.